When we were preparing for our trip to Eastern Europe, finding information online about various places in Macedonia (FYROM) was a bit difficult, as this part of the world is still relatively off-track. 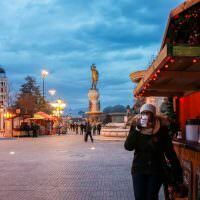 The Balkan nation of Macedonia is lesser-known than many other countries in the region, but even though it’s small in size, it’s jam-packed with activities, nature, and history. After visiting the capital city of Skopje, it was time to see some of the natural wonders that the country had to offer. We decided that having our own wheels would be the best way to fully explore, especially since buses don’t travel to all of the destinations that we were interested in. 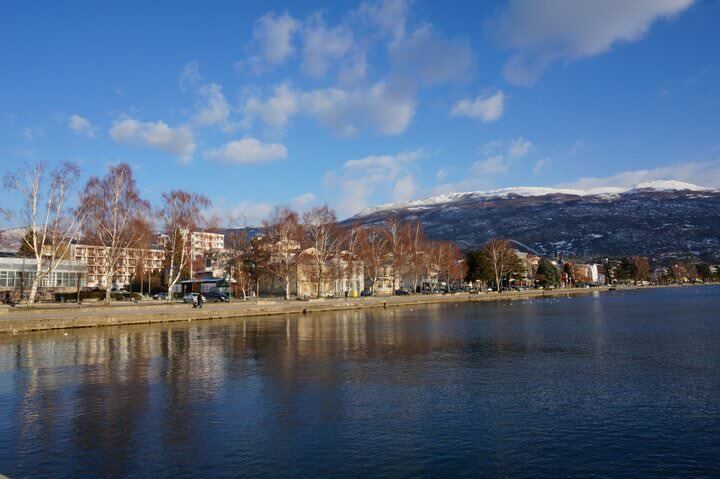 Lake Ohrid is one of the oldest and deepest lakes in Europe, and apart from being beautiful, we had heard rumours that lakeside apartments and hotels could be had for less than hostel beds! Coupled with the fact that there’s an amazing old town and ancient monasteries, this place sounded like perfection. We weren’t exactly sure of what the lake would be like during the winter off-season, but we decided to go for it anyways. The drive through the windy, wintry mountains was gorgeous and luckily for us, the roads were slushy, not slippery. We passed by quaint towns, decrepit buildings, and too many mosques and churches to count. 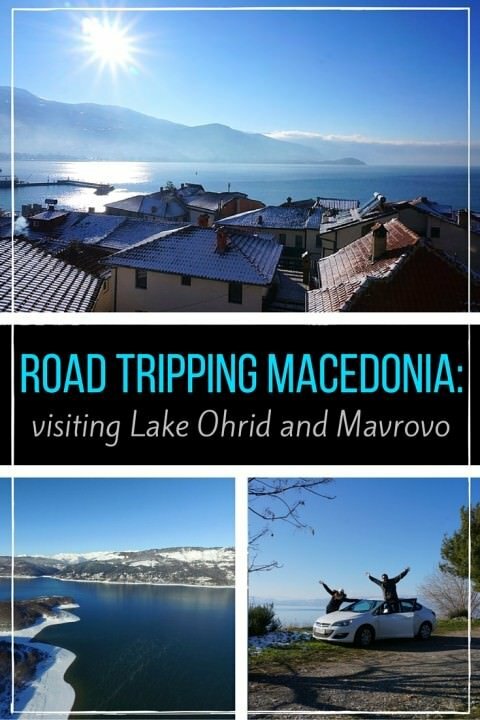 From a distance, we could see the shimmering water, but it wasn’t until we drove along the lakeshore that we realized just how gorgeous Lake Ohrid was – both the lake, and the town. Rather than rushing to check in to our hotel, we decided to park the car and wander along the shoreline. Our first views of the lake – stunning! The views looking back at the town and the nearby mountains were stunning. Jetting out from the northern side of the bay was a rocky outcropping, with a church perched on the edge. Crawling up the hillside were old, white buildings with red-tiled roofs, and lining the shore was a long pedestrian promenade. Even though it was a chilly -2 degrees celsius, the sun was shining and the sky was pure blue. We were looking forward to spending 3 days here. 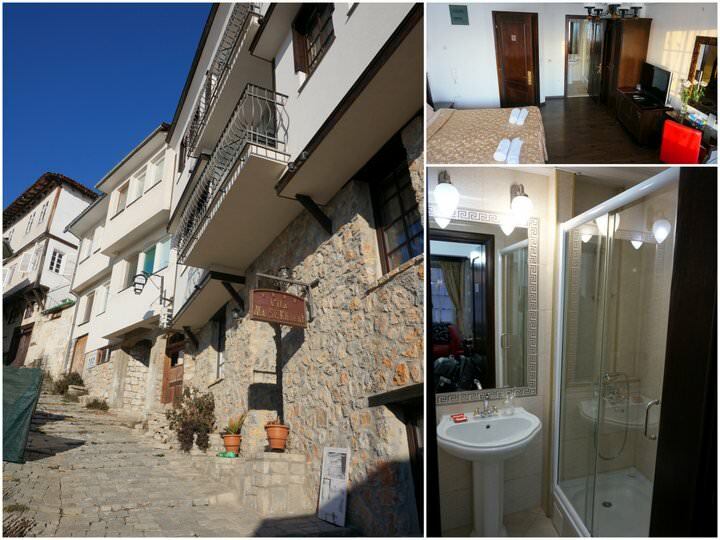 We chose to stay at the Mal Sveti Kliment House, which proved to be an excellent decision. Located on a quiet, cobblestone street, about a 3 minute walk from the water is this lovely home with just 8 rooms. The first thing we noticed when we entered the room was the incredible view of the lake from the windows! We opened the door to our private balcony and stepped outside. 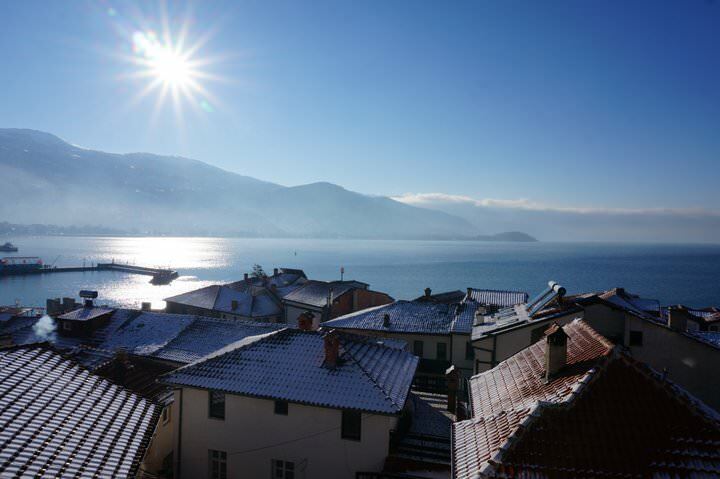 The sun was glistening off of the snowy roofs and steam was bellowing out of the chimneys. The bathroom was spacious and spotless, the room was large and comfortable and…there was central heating! The view from our room was unreal! The manager greeted us with lots of information about the area, and then announced that the owner, Budimir, had invited us to his penthouse room the following day to take part in the Epiphany celebrations. We weren’t sure what to expect, as we had never heard about this festival before, but we were honoured to be invited to partake in the festivities. It was so nice of the owner to invite us to his home for feasting with friends! Epiphany is celebrated by both Western and Eastern Christians, with those in the east commemorating the baptism of Jesus. To do so, they swim in the cold waters that surround them – whether it’s a lake, ocean or river! There is also feasting and celebrating afterwards. Apart from witnessing Epiphany, our days were spent exploring. There are endless things to do here, both on foot, and with a vehicle. 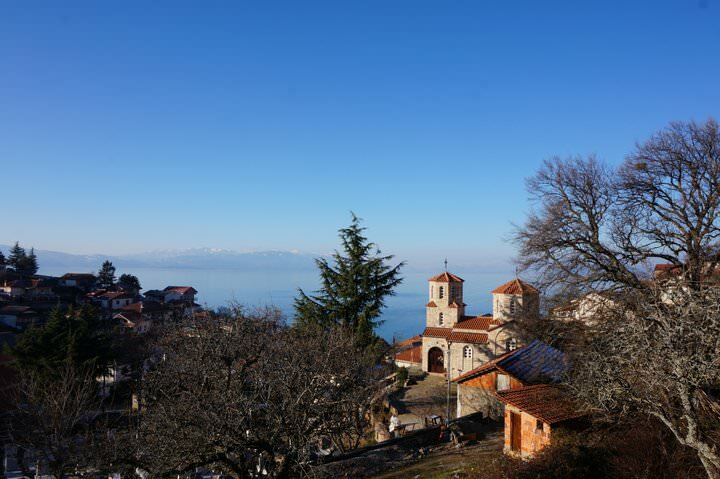 Don’t miss the Sveti Naum Monastery, St. Jovan Monastery (which clings to the cliff side), the Ancient Theatre, Sveti Sofia Church and Tsar Samuel’s Fortress. Wandering around the old town and driving around the lakeshore are definite highlights as well. From the lake, we headed to the mountains! Now, if you’ve been following us, you’ll know that we’re typically tropical travellers and that we’ve spent the last 2 years or so living and travelling in hot climates. So, it was a bit of a shock when we realized that Macedonia was going to be freezing cold and snowing for a portion of our stay. That’s right, we hit the slopes. Whoo Hoo, we’re on the skilift! There are three national parks in Macedonia, and Mavrovo National Park is the biggest. The drive in was amazing, and when we reached we were a bit confused as to whether or not we were in the right spot. We were expecting a ski hill, and instead, we saw a lake…. Once we checked in to the resort, we got some more information and realized that we were staying right on the lakeshore, and just a quick 10 minute drive would bring us to the actual ski hill. The scenery was incredible, but our skiing abilities were not. First of all, renting equipment here is cheap, and so is a day pass. Being from Canada where it’s so expensive to go to the ski hill, we were shocked at the prices (see the tips at the bottom). So that was great, however, no one spoke English up there! If there ever was a time where we needed someone who spoke our language, it was during our ski trip. We couldn’t figure out the hill, or which lift we needed to get on in order to find the “bunny hill” aka, easiest runs. Look at me, I’m skiing! We were literally on a lift and on our way to the black diamond runs by accident when we asked one guy where the chair was going, and his reply was nothing more than “dangerous”. Maybe he only knew one word of English, but it was a good one to know! When we finally did find the right lift, we couldn’t remember how to get on or off of it properly. With my skis and Nick’s snowboard, we ended up getting tangled up, screaming, and falling on our way off of the lift! Once we sorted ourselves out, we found the t-bar that would then take us higher up the mountain to where the easy runs are (this was totally backwards for us, as in Canada, the easy runs are at the bottom). Riding the t-bar proved to be a task as well and Nick ended up falling off a couple of times. But, we finally found our groove, and after a couple of hours, we were practically pros! Because we’ve been together for so long, and have been travelling for most of the time we’ve been dating, there aren’t many things that we haven’t experienced together. 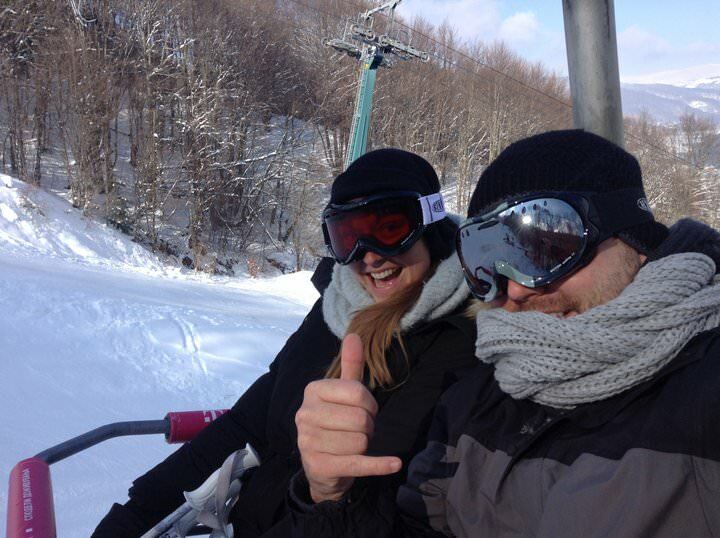 But, skiing and snowboarding was a first for us! I think that’s what made it more fun – especially because we were both awful at it. Check out our 10 day roundup video! 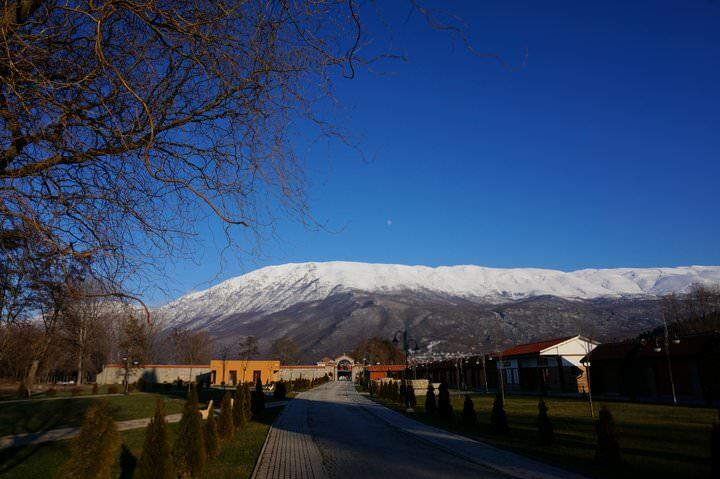 We highly recommend the Mal Sveti Kliment House. The rooms are very affordable ($28 / night when we were there), the staff are friendly and the location is perfect. 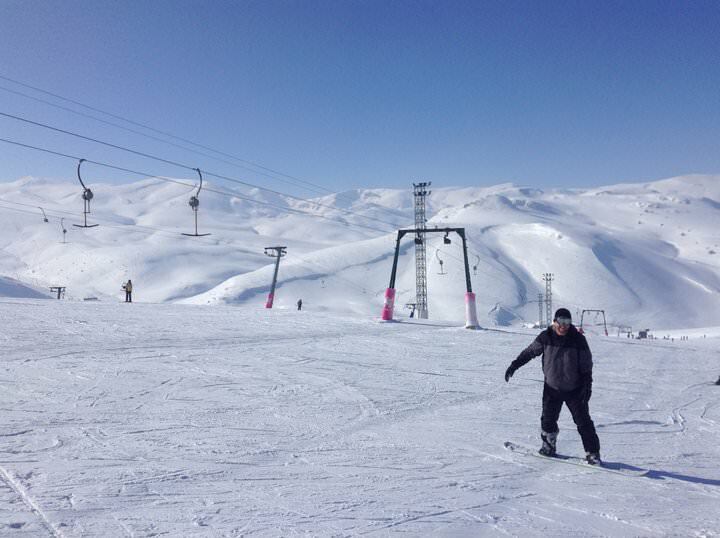 Ski passes at Mavrovo National Park are 850 MKD ($15) for a 1/2 day pass. Rentals including boots, skis and poles cost 500 MKD ($9). You can also rent jackets, gloves, toques, ski pants, etc. up at the hill. There are many highway tolls in the country, with most costing around $0.71. 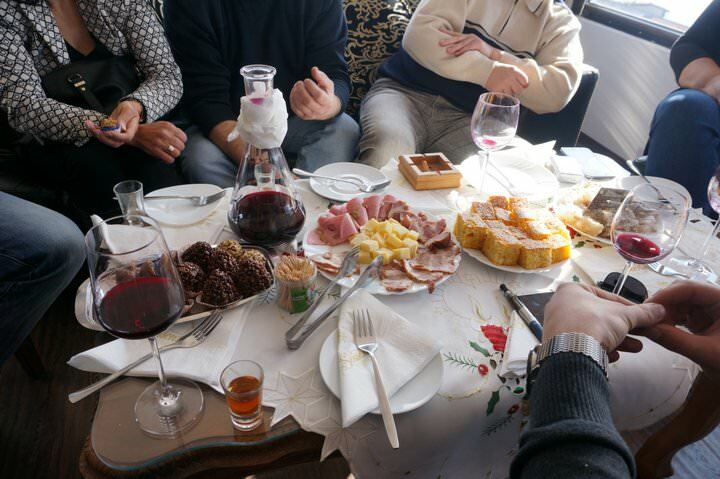 A huge thank you to Mal Sveti Kliment for hosting us during our stay at Lake Ohrid (and for feeding us! ), and a big thanks to Economy Bookings and Sharr Express for hooking us up with our car – it was a great road trip! As always, all thoughts and opinions remain our own, despite any complimentary services received. I can picture a couple of hopeless Canucks working their way down the mountainside on their butts! And I can completely relate after just returning from a family ski trip this weekend. I can tell tomorrow I’m gonna be a bit sore! The photos may be deceptive, but the ski hill didn’t look very busy. 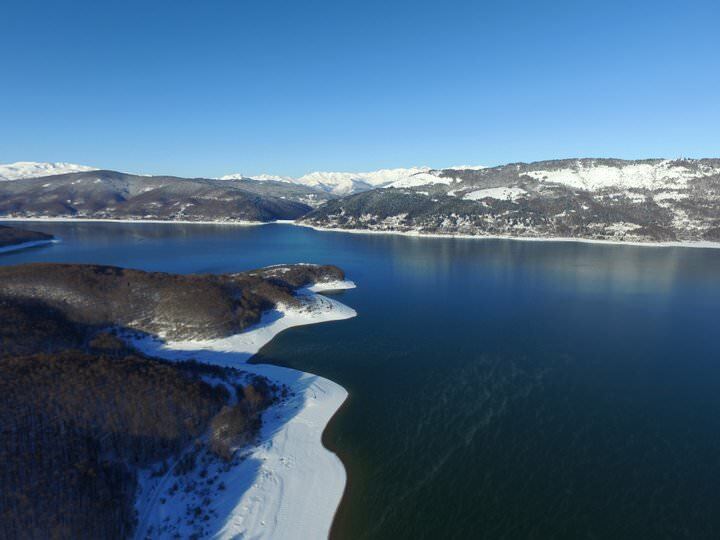 How are the crowds in Mavrovo? Great article, guys! You made me smile. 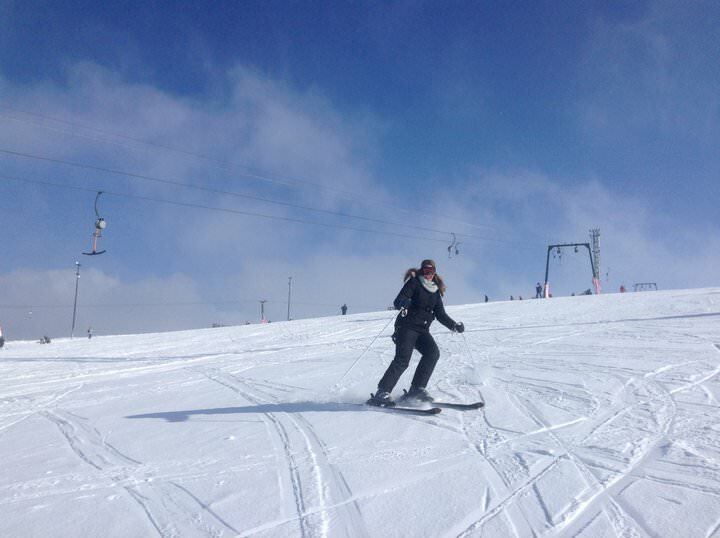 Haha images of you guys falling off the lifts is gold. Looks like the lake would be a great spot to relax for while 🙂 well done for hunting some hidden gems! Thanks! ya, it was seriously classic stuff 🙂 We looked ridiculous! We had an excellent time in Macedonia! I’ve been looking for Eastern European destinations and this place seems magical. How is Macedonian cuisine by the way? 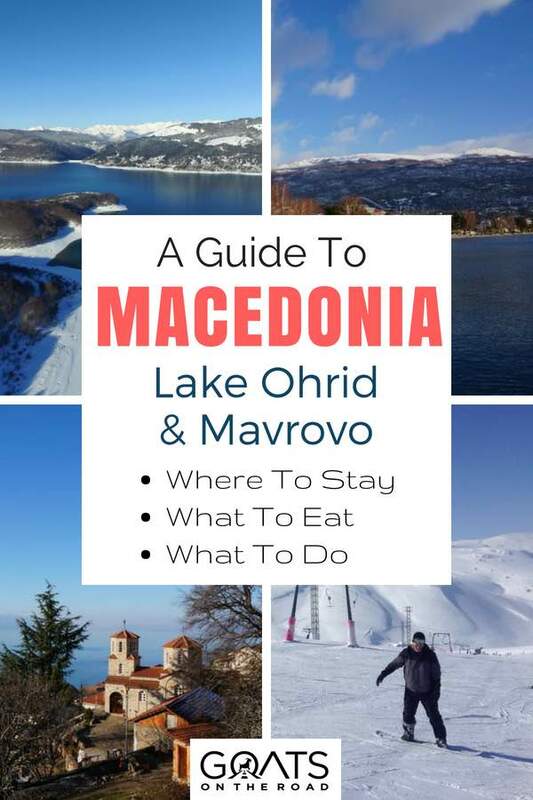 Also, thank you for including an estimation on how to budget a Macedonian trip! More power to you and your love, Nick and Dariece! Thanks for the comment Trish! Macedonian food was sooo good! Lots of options for vegetarians, lots of fish by the lake and international cuisine in the capital also. There is a Turkish influence in the old town of Skopje as well, so kebabs and such can be found there. Loved the food! I think I’m not a good Christian, didn’t have a clue about Epiphany! So nice that the owner invited you guys to join the festivities, those opportunities are priceless. Yes! Having a rental car is amazing – you get to see all of the random “in between” bits 🙂 Thanks for the pin and for reading! What a blessing for you to have first been a witness to that amazing Epiphany Celebration and then to be invited to celebrate in someone’s home! I loved watching the ceremony, my family and I would love to visit during that time to experience it ourselves one day. Ya, I imagine so for sure!…and for good reason 🙂 It’s an amazing place, and we didn’t see nearly enough! Wow Macedonia hasn’t really ever been on my radar, though it is now. What an incredible experience! I would definitely go for a rental car too – easiest way to see countries like this which have a little less tourism infrastructure than those which are more well known. How amazing that you had the opportunity to witness Epiphany – what an amazing cultural experience. Skiiing and Snowboarding is actually something which is still on my list, and we’re the same as you two, even though my husband and I have traveled quite extensively separate from each other before we met, this is something which will be a joint first. Can’t wait! Yes! Do it together, that would be awesome! haha. We had a good time for sure, and it’s cheap! Thanks for the comment, we really loved this country and enjoyed our road trip. It looks like a fantastic holiday, I love getting involved in festivities with locals! The photos make you guys look like pro skiers, perfect after some celebratory feasting. hahah, photos are deceiving 😉 lol. We were good by day two! I’ve been to the Balkans last year but unfortunately didn’t went to Macedonia – so this is a place where I definitely have to return to! 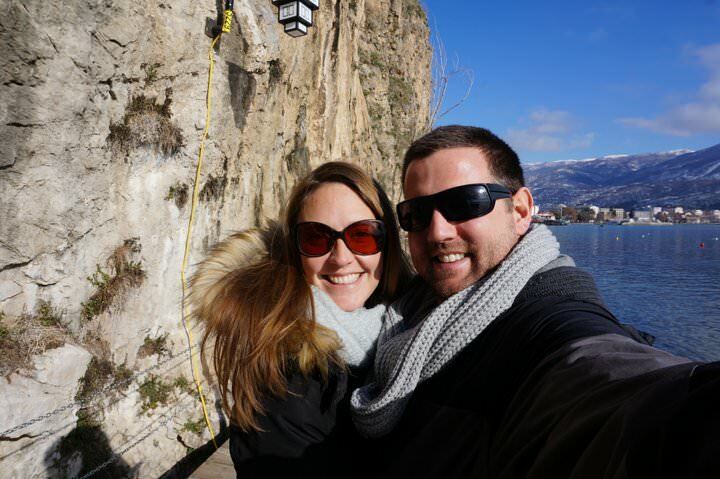 It sounds like you had an amazing time and I heard a lot of good things about Macedonia from other travelers, too. Yes! You’ll have to return for sure 🙂 Where did you go in the Balkans? Road Trip! You had a pretty epic one! I love raps trips in the winter, they’re so different! Especially when it’s snowy out! Great post, I loved it! Thanks for reading 🙂 Road trips are always fun. hahaha, omg, I can totally picture that! Ya, not surprised either that they didn’t have your boot sizes 😉 But, like you said, it makes for a fun day and some good memories! What a beautifully recorded holiday. 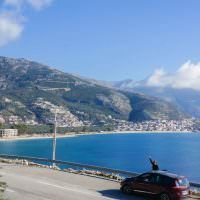 Say, did you guys face any issues (corrupt cops, issues with locals) in your drive from Ohrid to/thru Mavrovo? 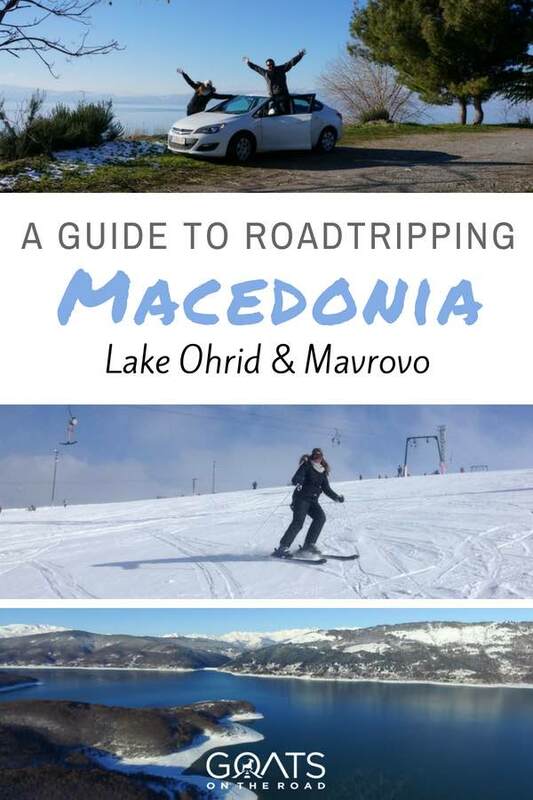 We intend to take that route rather than the highway to eventually reach Skopje from Ohrid and would really appreciate a vote of confidence :-)…Keep Blogging!